However, another Spanish newspaper, ABC, said the prosecution will ask for prison sentences of between 25 and 30 years for the former Catalan vice president, Oriol Junqueras, for being the ‘leader’ of the alleged rebellion. 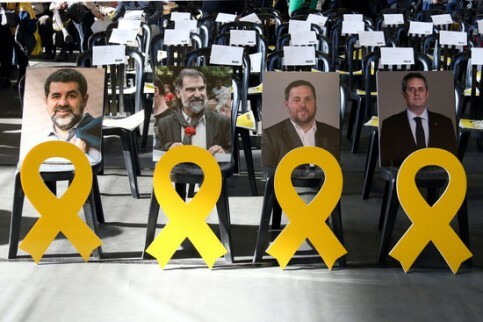 Yellow ribbons in front of photos of jailed leaders Jordi Sánchez, Jordi Cuixart, Oriol Junqueras and Joaquim Forn at a Catalan National Assembly event on 25 February 2018 (by Maria Belmez). Meanwhile, ABC says two activists in jail, Jordi Sànchez and Jordi Cuixart, could also get long prison sentences, depending on whether the judge considers them ‘leaders’ or ‘participants’ of the alleged ‘rebellion’. 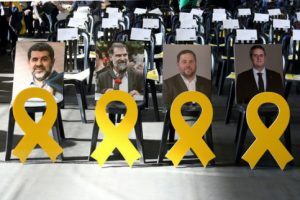 The speaker of the Catalan parliament, Roger Torrent, said that the only solution to the political crisis is for the prisoners to be absolved. ‘The only acceptable result is the absolution. Voting is not a crime, October 1 was the democratic expression of a people,’ said Torrent. Courts in Germany and Belgium rejected last spring extraditing Catalan leaders exiled there – including former President Carles Puigdemont, after considering that there were no grounds to prosecute them for violent rebellion.